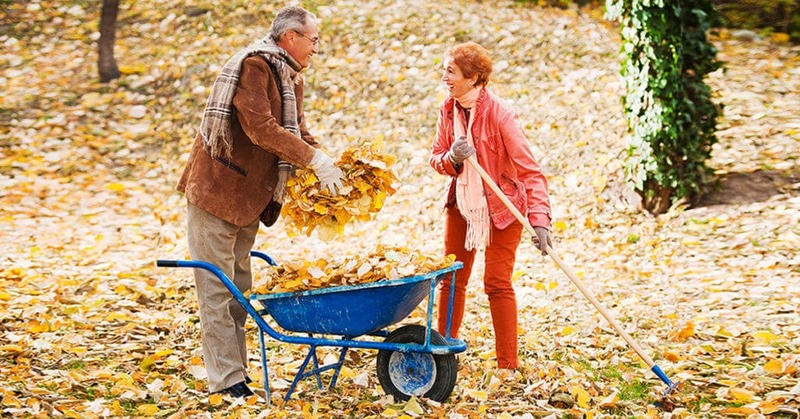 Before you reach for the rake for this season’s leaves, consider the possible consequences; upper or lower back strain, neck strain and pain in the shoulders. The twisting, turning, bending and reaching of raking or mowing can cause injury if your body is not properly prepared. Do warm-up exercises before before your yard work. Use a scissors stance when raking: right foot forward and left foot back for a few minutes and then reverse positions. Make your piles of leaves small to decrease the possibility of back sprain, and always bend at your knees when picking up the leaves. When mowing, use your whole body weight to push the mower rather than just your arms and back. Drink lots of water, wear a hat, comfortable shoes and protective glasses. If you have asthma or allergies, wear a mask. Don’t overdo it – take breaks when needed. If you do feel soreness or stiffness in your back due to yard work, use ice to soothe the discomfort. If there’s no improvement in 2-3 days, give our office a call at 410-876-8885 and schedule an appointment with Dr. Greg Lewis in our Westminster, MD chiropractic office. Chiropractic care is great for your overall health and wellness, and it can also address injuries you might have sustained from your fall yard work.